I have it here in book from N.F. the fella whos website the link is from. quote' the 208 grn ELD-M is my main go to bullet. I am happy to use this load on pretty much anything that walks at close ranges with the exception of dangerous game.driving the 208 grn at 2870fps the .300 wm breaks 1800fps at around 800 yards.provided recoil is mild,a moderate level of experience will seeone shot kills made wit relative ease inside this range" un quote. page 404 2nd edition long range hunting cartridges. On another forum, hunters with the 178 and 200 ELD-X in .308 have been reporting core separation with kills between 290 and 475 yards. Looks like the lead core is a pass through but they find the jacket under the far side hide. After testing numerous SSTs, I have come to a conclusion as to how the SST ejects its lead core and fragments. This may be what is happening with the ELD-X. As the bullet impacts and the copper jacket peels back/mushrooms, there is a point where hydraulic pressure gets between the lead-core and copper jacket. This causes the copper jacket to swell causing the copper's locking ring to increase in diameter releasing the lead-core - like a sabot. The lighter copper jacket with more frontal area decelerates and the lead-core continues on. In the case of the SST, the core fragments (more like grenades) causing massive internal damage. Double lung shots work out ok with the SST but other angles can result in lead contamination of the meat or limited penetration. The hydraulic pressure that causes the jacket to swell, is not present when testing bullets in ballistic gelatin. Can't sleep so I went out into the workshop and listened to "Red-Eye Radio" and measured bullets. The 178 ELD-X were very consistent +-0.001". The 145 ELD-X were pretty spread out (think I had 86 remaining). Until I learn more about this bullet and seating bullets based off the ogive-shank interface instead of COAL as Dawgdad pointed out, I'm going to use the 1.376" OAL bullets. Also, the tip on the 178s is somewhat translucent and a darker red than the tip on the 145s. Base to ogive dimension is within a 0.001" on the majority of the middle. The out-liers on the right are excessive being 0.005 to 0.008" more. Guess I will just dump them or use them for foulers. If you have a large number that are same ogive and same OAL make them your " special " lot. Then take 6 of those with the longest OAL and 6 with the shortest OAL but same ogive to within 0.001". Shoot a group of special, group of short, group of long and a group of short and long mixed together..
Then if you have a group with the longer base to ogive... shoot them separately and mixed with the specials. here is where you MAY see the group open up if the bullet is sensitive to jump. ( many secant profile bullets are) You may also find as I did with the 80 Nosler in .223 the sweet spot is about 0.015" wide and any jump in that range has same POI and grouping..
Reloading is a precision sport! I have my bullet comparator all set-up so I can try to load base off the ogive on Friday. pity we so far away Slim.....I would happily take and use up all those you reject...... at sub 300 yards (99.99999 % of my shots) the difference in poi would be less than caused by barrel temp variations. sometimes I think we overthink things. Elvis, I need to be prepared for shots out to 500 or even 600 yards so every little bit counts. I will use the out-liers to test BC and terminal performance and, while I'm doing it, compare accuracy to support our POI assessment. And yes, I wish we were close and didn't have to be just virtual hunting mates! ...And yes, I wish we were close and didn't have to be just virtual hunting mates! That would be outstanding, but could you imagine the stories around the fire...and the beer consumption? I'd pay to be part of that gathering. I know I over think things.. I am pretty sure I have not every had a rifle or load that I ever steered to it maximum potential. So many variables that i cannot control that I finally have reached an understanding of what is "practical" accuracy. I have adjusted my re-loading habits to do only the things that truly have a huge impact on the results and not sweat all the smaller things that can get lost in the noise from the factors I cannot control. I do not fault Slim for doing these things but appreciate the method and approach he has for satisfying his goals with a rifle and load. I typically stop when my load development reaches 1 MOA or less. Because this hunting trip has more long range potential, and I have this new bullet that is supposed to be unsurpassed in accuracy, I'm paying attention to all the details. I am about to see what difference it all makes. Thanks for all the comments and suggestions. Well, this is embarrassing to post. The second outing to the range is like the first never happened. The only difference is the temp was 20F cooler. I used the outliers in the Remington brass (10 bullets) and middle bullets in the Win Brass (3 bullets total). All were seated to have the same ogive depth as the 3 bullets in the Win Brass. Average velocities (middle diamond) were 50 fps more with large spread of min-max. With the velocities so much higher and variable, groupings were 1 to 1.5 MOA. Will likely sit these on the shelf until after my February Hunt. This is the first time I've used this Enduron powder. Its supposed to be temperature insensitive. I may have to test that also. Even though there was significant variation in bullet length and base-to-ogive, weight was pretty consistent with bullets within a 0.5 grain window. The weather broke yesterday and we had a nice afternoon so headed to the range. Only was able to work at 100 yards because of range closures. I was pretty much pleased with the outcome. Did two single powder charge velocity ladders and found the accuracy node after 5 shots with Winchester brass. 59.5, 60.0, and 60.5 all grouped within 0.2 inches. 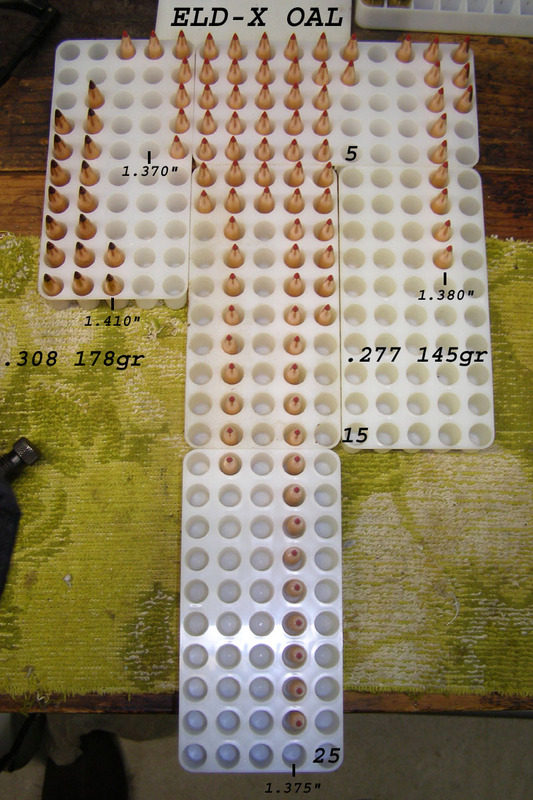 Add the 61.0 grain charge (right most of the cluster of four) and 4 sequential shots were still under a 1/2 inch. Completed the ladders just to gain experience with the new bullet. (recording the points of impacts while sitting at the bench shown in the lower right as an example). 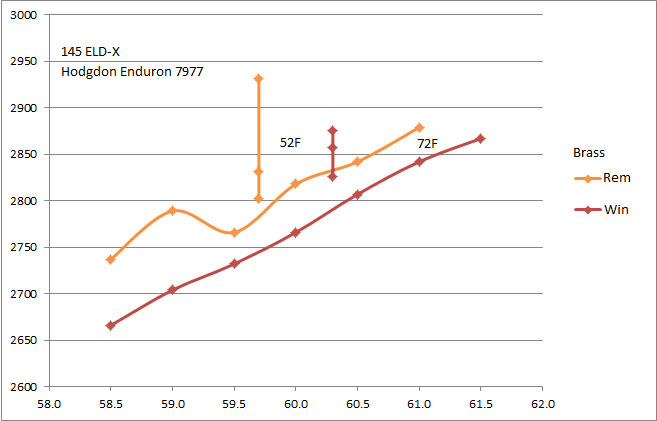 Adjusted my crosshairs for 60.0 grains of Enduron 7977 at the end of the session. The impacts with Remington brass where not as tight but it looked like the accuracy node is right around 2800 fps at this COAL which was maximum mag length for my Tikka T3 Lite. Pressure signs were noticeably less than my LRX load. Not sure I could get any faster with IMR4350. Since I may be hunting with this load next month, I'm going to stick with what I have and do some long-range work out to 500 yards next weekend. If everything hangs together, I should be ready for the hunting trip. I did a quick terminal performance test and the lead-core was shed at 100 yards. Penetration was more than adequate and impact force created a water slug that broke the plywood platform for the water jug which has only happen before with a .300 Win Mag. I need to do a full terminal test series using the alternative bullet trap as the lead core may be harder than ABLR but is still soft. Would you recommend I shoot each bullet/powder combination in sequence, or vary my shots (shoot load #1 with the Hunter, then load #1 with the Superformance, then load #1 with Varget, using different targets? First, make sure your barrel is not clean. If it is clean, foul it with a couple rounds before you start shooting for score. I've read where you should do the latter but I have found its too easy to make a mistake and shoot the wrong bullet at the wrong target (scrambles everything I'm doing). So I shoot the entire sequence than move on to the next bullet/powder combination. I wait for my barrel to cool. With my .270, that's just two shots before I put the gun back in the rack vertically to self vent and cool.